In 1981, the Urban Design Studio began in a renovated drug store in downtown Chattanooga supported by the University of Tennessee School of Architecture and the Lyndhurst Foundation. The goal in the beginning was to integrate the education of architects with the education of a community â€“ visual literacy, principles, attitudes, goals and vision. The Design Studio Retrospective takes a look back at more than 20 years of urban design and visioning for downtown Chattanooga. From the creation of the Studio in 1980, The Studio created a prodigious amount of visioning and design work that helped transform downtown Chattanooga. In the Summer of 2012, the collected works of the Studio were archived and selected pieces have been on display in an exhibition in downtown Chattanooga. The exhibition follows the work of the Studio as it progressed from general downtown structure studies to it's work on some of Chattanooga's most beloved places. The concept of the Design Studio initially grew out of the local architectural community's desire for University of Tennessee architecture students to focus their work on design projects in Chattanooga. In 1981, Stroud Watson, professor of architecture at UTK and founding director of UTK's Urban Design Program, received funding from the Lyndhurst Foundation to establish an urban design studio in downtown Chattanooga. The mission of the studio was to teach architecture students about urban design, and in the process educate the community about the role of design in the life of the city. The early work of the students focused on establishing an overarching urban design structure for downtown. As the structure took shape, student projects began to concentrate on the "heart of the city" (the Miller Park District) and the "origin of the city" (the riverfront). In 1982 the Studio produced the seminal Images of the City exhibition. The public exhibition of student architecture and urban design work established an overarching framework for downtown and featured six specific projects to support the framework: the Miller Park District, Downtown Housing, Fountain Square, a State Aquarium, Market Street Depot, and Landscape in the City. In 1982, Watson began his direct involvement with the community by serving as an advisor to the Moccasin Bend Task Force. In 1983, Mayor Gene Roberts appointed him as Urban Design Consultant to the City. The studio partners at this point included the City of Chattanooga, the Lyndhurst Foundation and UTK. In 1985, after several years of student work in the area, the Miller Park District Urban Design Guidelines were developed by the cooperative effort of the Studio and Koetter, Kim & Associates. As a proof of concept exercise, the studio engaged the services of five internationally recognized and local architecture firms to interpret the guidelines. Skidmore, Owings, Merrill from New York; Koetter, Kim Associates from Boston; Tuck, Hinton, Everton from Nashville; Peterson Littenberg Architects from New York; and Robert Seals, Architect from Chattanooga. The goal of this work was to demonstrate to the community that design guidelines could be interpreted in a number of unique ways that would not result in cookie-cutter building forms. On the heels of the exhibition, the City undertook the construction of the first phase of the district plan with the construction of Miller Plaza and Waterhouse Pavilion. During this process, the River City Company added staff to the Design Studio and joined the funding partnership. With the successes of early student work and the Miller Park District guidelines, Stroud and the Studio were recognized for their efforts. In 1987, the Studio and Koetter Kim & Associates received the 37th Annual Progressive Architecture Urban Design Award for their work on the Miller Park District Urban Design Guidelines. In 1988 Stroud received the Presidential Award for service to the profession from the Tennessee Society of Architecture. In 1989, the Miller Plaza development received an AIA Honor Award. In 1990, the Design Studio underwent its largest organizational transformation. The studio added the Chattanooga-Hamilton County Regional Planning Agency (CHCRPA) as an additional partner and changed its name to the Riverfront/Downtown Planning and Design Center. The center employed two full-time planners from the CHCRPA, an urban designer employed by RiverValley Partners (formed by a merger of The RiverCity Company and Partners for Economic Progress), and an administrative professional. That year the studio took up new offices on the second floor of the recently completed Miller Plaza building. The early 90's proved to be a dynamic time for Chattanooga and the Design Studio. The effort to embrace the birthplace of the city was realized with the construction of the Tennessee Aquarium. The studio played a critical role on the client team in working with Cambridge Seven Architects to ensure that the design of the aquarium was consistent with the vision and aspirations of the community. The Center also pushed for the design of the Aquarium Plaza to be guided by the principles of openness, inclusivity and access for all. In Stroud's words "We're not just building a front yard for the Aquarium, we're creating a front porch for the city." As the projects on the riverfront were finishing construction, the student work began to focus on the neighborhoods of the Southside. As with Miller Plaza and the Riverfront, student work was focused on the area before staff and professionals tackled "real world" projects. The planning efforts in the Southside included work by staff, as well as professional firms including the likes of Calthorpe Associates, William McDonough Associates, and Dover, Kohl Associates. 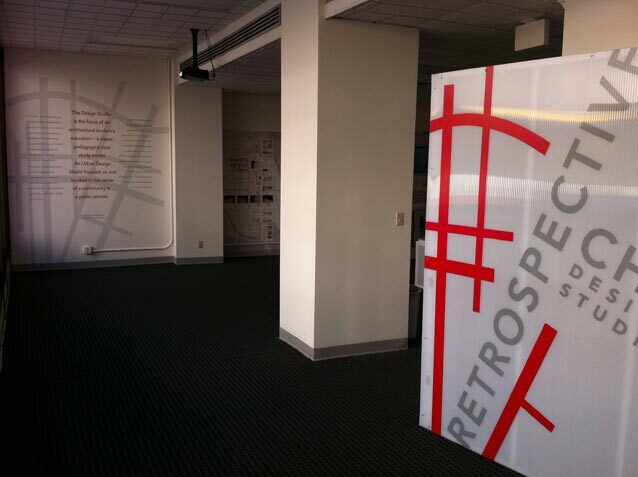 As was the case in the 80's, the Design Center was recognized for its work in the 90's and early 00's. In 1992, the Center was awarded the Scenic Cities Beautiful Award. In 1993, the "Downtown Plan" won the Comprehensive Planning Award from the Tennessee Chapter of the American Planning Association. In 1995, Stroud Watson was awarded the Tennessee Community Service Recognition Award by the Tennessee Higher Education Commisssion. In 1997, Stroud received the Association of Collegiate Schools of Architecture (ACSA) Distinguished Professor Award. In 2001, Stroud Watson received the Thomas Jefferson Award for Public Architecture from the American Institute of Architects. Shortly thereafter, the studio moved from Miller Plaza to new accommodations in the Development Resource Center. Although the community's initial attempt to return to the river was wildly successful, it did not actually achieve the goal of engaging the River. In 2001, under the leadership of Mayor Bob Corker, work began to complete the connection. The Design Studio played a critical role in the development and implementation of the 21st Century Waterfront Plan. After a change in administration at the UTK School of Architecture, the decision was made to suspend the Chattanooga satellite studio. The last group of students passed through the studio in the spring semester of 2003. Shortly after the election of a new mayor in 2005, Stroud's contract as Urban Design Consultant to the City was not renewed. The studio continued to exist for a short time afterward, without Stroud, his students or the partnerships with Lyndhurst, the University and River City. Eventually, the city reorganized and the Studio ceased to exist altogether. The studio lives on in the work of the dozens of architects that passed through the studio. It can be found in the award-winning public places in downtown Chattanooga, it expresses itself in the sophistication of the local professional community, and is made conspicuous by a citizenry that is well versed in the principles of urbanism and design. The Design Studio was a principle driven institution. Consistent principles were applied to how and what the students were taught, how the studio conducted business, what the studio interjected into the community discourse, and how it advised public and private sector entities. Underpinning all of these principles is the belief that design matters in the life of a city and its citizens. The studio embraced that philosophy that great cities don't just happen; they are the result of long-term plans and visions that are driven by the collective conscience of the citizenry. The quality of life, image and marketability of the city is very much a product of the excellence of planning, design and implementation of its public realm. In the education of students, the studio espoused established principles and theories of urban design while experimenting with new techniques and concepts. Student work focused on the urban public realm - the streets, parks plazas and open spaces that form the city's "living room". The students learned that the elements that defined the public realm should be designed in a way that expresses the values and aspirations of the community. To augment classroom teaching, examples of urbanism both abroad and at home were used to highlight principles of good urban design. In all of this work, students were taught to "reflect the past, reinforce its present, and predict a future." In daily operation, the studio operated on the core principles of transparency and inclusivity. The studio embraced the belief that everyone in the community had the right to have a say in the development of the city. That principle was supported by the belief that decision-making process on matters of civic development must be open and transparent. The physical space of the studio (both at Miller Plaza and the Development Resource Center) was consciously designed in a way that reinforced those principles. The central meeting rooms at the center of each studio were designed to be open room with no doors, allowing all meetings to be seen and heard by anyone who wished to attend or who happened by. The philosophical underpinning of the work in Chattanooga is the vital importance of downtown. Downtown was seen as the physical and psychological center of the city and region with its health directly impacting that of the larger community and region. Within downtown, the riverfront was seen as having primary significance. As the reason the city exists and as the place of the city's birth, the river was treated as the community's most precious natural resource. The Studio espoused the principle that the river belongs to all Chattanoogans and should be made as publicly accessible as possible. The Design Studio was involved in a broad assortment of work. The work ranged from purely theoretical visioning and designs to specific "real-world" project work. Those working in, with, or on behalf of the Studio can be broadly grouped into three categories: students, staff and professionals. The Studio began in the academic world as a satellite studio for the University of Tennessee Knoxville College of Architecture and Planning. Fourth-year architecture students came to Chattanooga during the spring semester for work on Chattanooga-based urban design projects. In addition to those students taking courses, the studio employed student interns throughout the year. The role of the student was fundamental in how the studio operated and how it was able to introduce concepts into the civic dialogue concerning design and urbanism. The Studio demonstrated that work done by students was often more effective than work done by professionals - the naivete' of students enabled them to propose crazy and creative concepts that a professional with years of baggage relating to what can and can't be done wouldn't do. It also found that the community is often more receptive to student visioning work because it is perceived to be less threatening than visions put forth by governmental agencies. As the Studio evolved over the years, so did the staff. In the early days of the studio, the director was the sole staff member. As the work of the studio progressed and funding partners were added, the staff increased. In the late 80's the River City Company added the position of urban designer. In the early 90's when the studio became part of the Regional Planning Agency, the biggest staff increase occurred with the addition of a director, city planners, historic preservation planners, and administrative positions. The staff produced work that ranged from authorizing downtown plans in 1992 and 2002, to specific site and building design studies. Though the staff was funded through different sources, the work of the studio was conducted through interoffice teamwork and collaboration. From its inception, a constant theme of the studio was its connection to private sector professionals. The studio played the role of client, collaborator and sub-consultant on a variety of private-sector projects over the years. In addition to work on real-world projects, the studio helped to help elevate the level of work of the professional community through education, critique and collaboration. The University of Tennessee School of Architecture was one of the two founding partners of the Design Studio. The primary benefit of the studio for the University was the opportunity to engage their students in projects with real-world ties instead of theoretical exercises in the classroom. Beyond the obvious benefits of student education, locating a physical studio in a community was a public service by the institution to the state that it serves. The second founding partner of the Studio was the Lyndhurst Foundation. The Foundation was formed in the 1930s with the mission of providing medical welfare. In the 1980's the mission was shifted to helping the revitalization of downtown Chattanooga. Early on, the foundation recognized the crucial role that design and visioning played in the life of the city, a realization that led to approaching the UTK School of Architecture with the concept of establishing a satellite studio. In addition to supporting the student work of the studio, the foundation was advised by Studio staff in its efforts to invest in the revitalization of the city. Mayor Gene Roberts was one of the first public officials in Chattanooga to recognize the potential benefits of design and visioning. The Mayor engaged the services of the Studio director as an urban design advisor to the city. This relationship was maintained through subsequent administrations. The city was the ultimate beneficiary of having leadership that recognized the importance of urban design and an advisor that continually and consistently interjected issues of urbanism and design into leadership of the community. In the 1990's the Chattanooga/Hamilton County Regional Planning Agency became a partner in the Studio. The planning agency staff, housed in the studio, contributed to the overall body of visioning and planning work produced by the studio. That staff also performed the day-to-day duties of the planning agency in making zoning and subdivision recommendations for planning districts located in the downtown. The Design Studio became synonymous with its director, Stroud Watson. In 1980, after serving as Principal Architect for the New Town of Milton Keynes in England, Stroud moved to Chattanooga where the Design Studio provided him the opportunity to return to teaching and simultaneously work directly with a city. His initial time in Chattanooga was critical to defining "downtown" philosophically and physically through a visual perspective of the past, present and future. Stroud encouraged the shift from considering the city as a collection of built objects to embracing the importance of the urban public realm â€“ the streets, squares, parks and public buildings that collectively form the "living room" of the city. The Studio Director was lauded by numerous professional organizations, and his work is on display for all to see on the streets of downtown Chattanooga. The Design Studio was a model for collaboration and partnership. Over the years, the Studio partners included the University of Tennessee School of Architecture, the Lyndhurst Foundation, The City of Chattanooga, and the Chattanooga/Hamilton County Regional Planning Agency. The 2012 retrospective exhibit and the creation of this site were made possible by a partnership between the Benwood Foundation, Lyndhurst Foundation, River City Company and the Watson Fund. In 2012, to commemorate the long history of the Design Studio, a former employee by the name of Christian Rushing embarked on an effort to tell its story. He collected documents created by or in association with the Studio spanning from 1980-2005. He also meticulously documented the accomplishments and important milestones in the life of the Design Studio. Together, they help to tell the story of a critical piece of Chattanooga's living history. In July of 2012, a retrospective exhibition featuring the work of the studio was installed at 831 Chestnut Street, which remained in place and available for free public viewing through October of that year. At the same time, this site was launched to make the story of the Studio led by Stroud accessible to all. In 1981, the Urban Design Studio began in a modest renovated drug store in downtown Chattanooga supported by the University of Tennessee School of Architecture and the Lyndhurst Foundation. The goal in the beginning was to integrate the education of architects with the education of a community - visual literacy, principles, attitudes, goals and vision. The Design Studio is the focus of an architectural student's education - a classic pedagogical case study model. An Urban Design Studio focused on and located in the center of a community is a public service. How the community is designed, built and cared for is a result of the community's ability to form a shared vision that is special to Chattanooga, a memorable vision that reflects its past, reinforces its present and predicts a future. The Urban Design Studio initiates and sustains a dialogue with the community and gives visual presence to those visions. "The river has always been our lifeline - it is the reason for city's existence. We can reconnect with the river and establish a new image that becomes a generator for the future." "The River is fundamental and I believe is the future. But, in fact, the first opportunity and strategically the most important, is the heart of our City, the Miller Park District." "When the city was laid out, this area was obviously set aside for housing. This presents a rare opportunity: a chance to put affordable housing right in the city center."